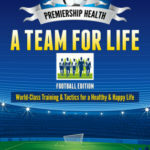 I have been writing a health blog for my patients for a few years now, using the analogy of a football team adopting holistic tactics to improve how well they play, to represent the changes people need to make if they want to improve their own health. Like many, my frustrations with the current sickness model of health have been growing with nearly every new prescription I write, and yet I continue with these Sisyphean pursuits, because the struggle itself, towards new horizons, new paradigm shifts, is enough to fill the brain with optimism and the heart with vigour, and push on against seemingly endless resistance from above. It is a game for the brave and inquisitive, for those who want to unearth the truth and unravel the root causes of health problems today, rather than blaming the innocent victims and offering prescriptive platitudes. It needs to be played with purpose and tactical nous and a belief that we can make a difference, if we are to score the ultimate goal of justice for our patients. On the 15th April 1989, an FA Cup semi-final game between Liverpool and Nottingham Forest, played at Hillsborough, the home of Sheffield Wednesday, saw the biggest disaster in British sporting history. The ramifications of this tragedy are still being felt today. Kevin Traynor, was 16 years old when he died in the Hillsborough disaster alongside his older brother Christopher, 26. The year before he had gone to another game at Hillsborough, also between Liverpool and Nottingham Forest and witnessed similar scenes of crushing and overcrowding, but thankfully nobody died on that occasion. Henry Rogers, was a 17 yr old, hoping to get a place at the London School of Economics when he was killed at Hillsborough. His older brother Adam survived the disaster only to die a few months later from a diabetic hypoglycaemic coma. A total of 96 fans lost their lives and 776 were injured at Hillsborough on that fateful day, and many more family and friends had a lifetime of grief to endure. I remember witnessing those horrific scenes on television, thinking how can all these people die at a football stadium, when all they wanted to do was support the team they loved and enjoy a simple game of football? A human tragedy, that ultimately changed the way we viewed the sport. I am now beginning to have similar thoughts about type 2 diabetes. Patient X was a type 2 diabetic on insulin, developed gangrene in his left foot and had to have his leg amputated below the knee. I told him, you can, but not by following the current dietary guidelines. The newspaper claimed the deaths were the result of “mass drunkenness” by the Liverpool fans, who had urinated on police and even picked the pockets of the dead bodies as they lay on the pitch. The story the establishment (police, government, media) perpetuated was one of drunken hooligans being responsible for the deaths of innocent people. Indeed, the press secretary to Margaret Thatcher, at the time, Sir Bernard Ingham, said he was told on the day that the disaster was caused by a “tanked-up mob” of Liverpool supporters. They wanted the public to believe the disaster was caused by the fans, not by the police losing control. In much the same way, the establishment (drug companies, food companies, politicians) want us to believe the “Truth” of Type 2 diabetes is one of a chronic, progressive disease, caused by our own greed and sedentary lifestyle. This is the metabolic disaster taking place in the majority of our Stadia today, killing millions of people every year, and the tragedy is most of these deaths, just like at Hillsborough, could be prevented. The real truth never came out at the initial Hillsborough inquest, it was incorrectly blamed on alcohol and hooliganism. My sincere hope for Diabetes is that the real truth, that it is a dietary, lifestyle disease, demanding a dietary lifestyle solution, will not take so long to uncover. Of course we must remember that Hillsborough happened at a time when football hooliganism was rife – it was regarded as “the enemy within.” There was a belief that every football fan was a hooligan until proven otherwise and deserved to be treated as such. Similarly, diabetic patients have had the truth hidden away from them and only now are more and more people waking up to the reality that the condition can be reversed once you start addressing the root causes of the problem – Insulin Resistance and inflammation. Unfortunately, Medicine has its own Hooligans – those self-limiting beliefs that stop us questioning the so called truth, because we believe we already have the answers. This psychopathology of knowledge pervades many of our current beliefs about diabetes, and until these are challenged and changed, the same mistakes and bad advice will perpetuate to the detriment of people’s health. These include; the belief that diabetes is progressive and chronic, that the best way to treat it is with medication, and that carbohydrates are essential for a balanced diet for diabetic patients. The human tragedy is that lives are being needlessly lost, not just from diabetes, but from all the chronic diseases – heart disease, dementia, and yes even cancer, because we are giving our patients the wrong dietary advice. The Hillsborough inquest heard that before kick-off it was apparent not everyone would be able to get into the ground, and one police constable even radioed the control room requesting the game be delayed for the safety of the fans. This message was not taken seriously, with disastrous consequences. There are a few doctors today sending out similar warning messages relating to type 2 diabetes that are also being ignored. The message that it can be reversed, that diet is the answer, not the drugs we prescribe, and that the main culprit is eating too much sugar/carbohydrate and overcrowding the fat cells, leading to insulin resistance. Another fatal mistake at Hillsborough, was the decision by the commanding Police Officer to open the exit gate and allow even more fans into the already overcrowded stadium, and as more people were let in, there was a huge surge to get inside the ground and the weight of the crowd inevitably pushed those at the front up against the perimeter fencing, suffocating them in the process. Here again we see similarities with the metabolic disaster of diabetes. In type 2 diabetes we have a stadium (adipose tissue, liver and pancreas) already crammed to the rafters, and a situation in which more fans (glucose) are trying to enter the ground. You eventually reach the point of resistance inside the cell, which forces the glucose to spill out onto the pitch and into the blood stream. Then, instead of doing the sensible thing, and stopping anymore (glucose) entering the ground and allowing time for some to escape, we make the same mistakes that precipitated the disaster at Hillsborough. We ignore the initial warnings, continue to let glucose molecules into the cell by eating carbohydrates and then open the gates and force them inside with the medications we use (e.g insulin) causing the fat cells to get squashed, suffocate and eventually die. Naturally those fans (glucose) left outside the ground (cell) get annoyed because they can’t get in and start causing a disturbance in other areas of the stadium (eyes, kidneys etc) and in doing so, the problem merely gets shifted to another location. Worse still, by telling people to eat a balanced diet, with plenty of fruit and so-called “good” carbohydrates (e.g. Porridge, rice, lentils) the problem is compounded, because we are essentially blocking their best chance, their one main escape route from this metabolic disaster – a low carb diet. In much the same way, fans at Hillsborough were prevented from carrying the injured to waiting ambulances by the established police cordon, for fear of further trouble outside the ground. Of the 44 ambulances in attendance and over 80 paramedics, only one paramedic, Tony Edwards, managed to get on the pitch and administer CPR, and a pitiful 82 of the 96 victims were pronounced dead on the pitch, never making it to hospital with a chance of survival. The jury concluded that blunders by the police and ambulance service on the day had “caused or contributed” to the disaster and that the victims had been unlawfully killed. To reach a verdict of unlawful killing they had to be sure of four “essential” components concerning the 96 deaths at Hillsborough. 1.They had to be convinced the match commander, chief superintendent, David Duckenfield owed a duty of care to those who died. 2. He was in breach of that duty of care. 3. They would need to be satisfied this breach of duty caused the deaths. 4. It amounted to “gross negligence”. • Sheffield Wednesday’s then consultant engineers, Eastwood & Partners, should have done more to detect and advise on any unsafe or unsatisfactory features of the stadium. I wonder if the medical profession and drug companies will ever face similar allegations about their treatment of type 2 diabetes and if so, will the jury be similarly damning? The medical profession already has a number of large randomised controlled trials (UKPDS, ACCORD, ADVANCE, and VADT) which suggest current treatments are less than adequate. And, with the recent 5 continent PURE study threatening to dig up the foundations of the standard food pyramid and turn it upside down (high fat intake associated with a reduced risk of mortality), now is the time to start questioning the current guidelines for treating diabetes, rather than waiting for anymore inquests and studies. Because, telling people with diabetes or even pre-diabetes to eat carbohydrates, is like opening the gates at Hillsborough to let even more fans into an already overcrowded area of the ground, and unless we start giving the appropriate advice, the stampede through the cellular turnstiles will continue unabated and millions more will be inflicted and injured, and no longer will we be able to plead ignorance. Luckily for football, the environment was allowed to change. The inquiry into Hillsborough, the Taylor Report, signalled the end of an era of decrepit, dilapidated stadiums, where fans were kept in cages. All top-flight football clubs were made to change their grounds to all-seater stadiums; standing terraces were banned and the spike-topped fences that had kept fans off the pitch were scrapped. The impact was dramatic, not only was the risk to fans reduced, but the whole experience of watching football changed. Hooliganism, the curse of the English game, dwindled and more families returned back to watch the matches. Football became entertainment again rather than tribal warfare. Perhaps, we need to take note and introduce similar changes to the treatment of our diabetic patients. Diabetes even has its own “Taylor” report, except this one is by Dr Roy Taylor, a consultant at Newcastle University, who has demonstrated that type 2 can indeed be reversed, by an intensive (8wk) very low calorie diet (600 cal daily). Or, we could look at the work of other doctors who have successfully reversed diabetes in their patients, like Dr Jason Fung, who advocates a low carb diet in conjunction with intermittent fasting. Or, let us simply take the recommendations of the original Taylor report itself, to see if we might be able to take a preventative route to stop diabetes happening in the first place. This obviously reduced the capacity of the grounds and in dietary terms is akin to ensuring you don’t pack as much sugar into the fat cells. In other words, you limit the intake of carbohydrates and ensure the ground is emptied in a controlled fashion before the next game kicks off (meal). A tighter control of who is let inside the ground, by carefully tracking ticket allocation and admission. Again, in dietary terms, you control what you are eating – allow plenty of time to get inside the ground and equally as important, ensure the exit is as easy as possible, through the use of resistance exercise and periods of intermittent fasting. Other recommendations of the Taylor Report included; restricting the sale of alcohol within stadiums, and ticket prices. Both analogous to recent proposals to introduce a sugar tax, which has so far been resistant to our commanding officer, Mr Jeremy Hunt, even though a recent report in the Lancet (Jan 2017) suggested it could reduce the number of diabetics by 19000 per annum. So there you have it – a simple 1 – 2 approach to tackling the Diabetes epidemic. Reduce the number of fans entering the ground – with a very low carbohydrate diet. NB. We already have a medication that can do this – Acarbose – (reduces risk of heart attacks and stroke by almost 50%) but is poorly tolerated. Allow the ground to be emptied from time to time by using intermittent fasting or very low calorie restriction diets, thereby making it more comfortable for those already inside and create extra space before the next match (meal). For too long we have sought to blame people for eating too much and not exercising enough, thereby exonerating our profession from any responsibility. The message we gave was “it’s your fault,” except it wasn’t their fault. It was a failure of the doctors and researchers to understand the problem. We thought it was a problem outside the ground, whereas, in reality the biggest problem was going on inside the ground (cell). That’s where we find the bodies. It’s not about too much sugar in the blood, it’s about too much sugar in the whole body, and in particular the cells and until you start emptying the whole stadium with a low carb/intermittent fasting regime and making it safe again, another Hillsborough disaster is waiting to happen. However, the reality is these guidelines are based on evidence derived from the past and predominantly funded by the drug companies themselves, and with the half life of medical education estimated to be 4 years, if you’re following guidelines, you are not actually at the cutting edge of medical research. For instance, during my time in medicine I have seen beta blockers change from contraindicated to first line treatment in heart failure, I have been told to give iv insulin to heart attack patients with high blood glucose, only to find out later this actually made them more likely to die. Then I was asked to keep HbA1c too low, which probably contributed to some of my elderly patients falling over and fracturing their hips when their blood sugars went too low. And now there are proposals to reduce everyone’s cholesterol to 5 and below, whereas only a few years back 6.4 was deemed satisfactory. I confidently predict the over-prescribing of cholesterol lowering Statin medications to be the next medical Hillsborough, unless we start asking questions and begin focussing on the root causes of chronic diseases. These diseases, which cost so much and cause so much suffering, are being treated with medications that make very little difference to the final outcomes and we are compounding the problem by giving people the wrong dietary advice. I’m sick of hearing from healthcare professionals (doctors, nurses, and dieticians) that we need to eat a balanced diet full of whole grains, plants and fruit. It’s as if the word “balance” itself has some magical health inducing powers, ignorant of the fact it might actually be making things worse. The NHS is collapsing, largely under the welter burden of chronic diseases like diabetes and simply telling someone to eat a balanced diet is quite frankly negligent. Desperate times call for desperate measures, not guidelines designed to suit the needs of big pharmaceutical companies and their willing accomplices in the food industry. Try telling the families of the victims of the Hillsborough disaster that the Commanding Officer David Duckenfield was just balancing the numbers inside and outside the ground when he gave the order to open the gates and then subsequently lied to the inquest when he said the fans forced the gates open themselves. If you have a situation where the ground is already full, which is the case in diabetes, and the body is telling you that by demonstrating resistance, then you don’t add insult to injury and try to force even more glucose inside the cell, just to make the figures on the outside (blood glucose) look better. As Jason Cowley put it in his book: The Last Game: Love, Death And Football, the tragedy of Hillsborough, was English football’s “point of no return.” The culture of the game had to change. I would argue the tragedy of chronic diseases like diabetes is now the NHS’s “point of no return.” We can no longer afford to step back and watch millions of innocent people die prematurely, costing billions of pounds(£10bn/yr) to the economy, when the solutions are very simple and inexpensive. We’ve been giving the wrong advice for years to eat a balanced diet with lots of carbohydrates, and if you give the wrong advice, just like at Hillsborough, people die. Only this time we are talking far more than 96 innocent people. Play Well, Get your Teams in Shape, and Take Care!